Watch the official I’m Dying Up Here TV show trailer. The new series takes place in L.A.’s standup comedy scene. I’m Dying Up Here will premiere on Showtime on Sunday June 4, 2017 at 10:00pm ET/PT. 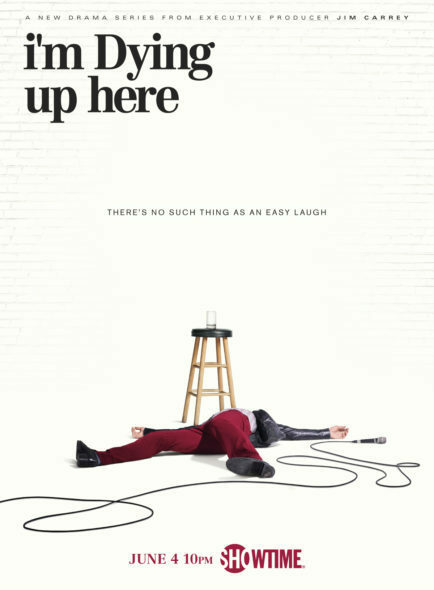 A scripted comedy-drama from creator David Flebotte, I’m Dying Up Here stars Melissa Leo, Ari Graynor, Michael Angarano, Clark Duke, Andrew Santino, Erik Griffin, RJ Cyler, Al Madrigal, and Jake Lacy. Flebotte executive produces the Showtime TV series with Michael Aguilar, Jim Carrey, and Christina Wayne. Check out the new trailer and this Showtime press release. NEW YORK, NY – April 7, 2017 – Today, SHOWTIME will debut the new trailer for the network’s one-hour drama series I’M DYING UP HERE, which will kick off the SHOWTIME summer lineup on Sunday, June 4 at 10 p.m. ET/PT. The fictional series explores L.A.’s famed ’70s stand-up comedy scene and stars Academy Award® winner Melissa Leo (The Fighter, Treme), Ari Graynor (Bad Teacher), Michael Angarano (The Knick), Clark Duke (Hot Tub Time Machine), Andrew Santino (Mixology), Erik Griffin (Workaholics), RJ Cyler (Power Rangers), Al Madrigal (The Daily Show) and Jake Lacy (Obvious Child) as part of a large ensemble cast. The series is created and executive produced by Dave Flebotte and executive produced by Golden Globe® winner Jim Carrey, Michael Aguilar and Christina Wayne. I’M DYING UP HERE delves into the inspired, damaged and complicated psyches of those who stand alone in front of an audience “dying” for fame, fortune and, with any luck, a shot on Johnny Carson. This fictional group of competitive but close-knit comedians is mentored by “Goldie” (Leo), a brassy comedy club owner who rules over her business with an iron fist, but nurtures her comedians with tough love. For Goldie and her crew, there’s truly no such thing as an easy laugh. Recurring guest stars include Stephen Guarino (Happy Endings), Brianne Howey (Horrible Bosses 2), Jon Daly (Kroll Show) and Ginger Gonzaga (Togetherness). Guest stars include Emmy® nominee Dylan Baker (The Good Wife), Oscar® nominee Robert Forster (Jackie Brown), Oscar nominee Cathy Moriarty (Raging Bull), With Sebastian Stan (Captain America: The Winter Soldier, The Martian) and Emmy nominee Alfred Molina (Chocolat). Produced by SHOWTIME, the series is based on the non-fiction book of the same name by William Knoedelseder. The pilot was written by Flebotte and directed by Jonathan Levine (50/50, Warm Bodies). For more information about I’M DYING UP HERE, follow Twitter and Facebook, and join the conversation using #IDUH. What did you think of the official I’m Dying Up Here TV series trailer? Do you plan to check out this new show when it premiers on Showtime? Let us know, below.